It’s Christmas Eve in America. The streets are filled with the usual hustle and bustle of a lieutenant colonel on the run from his own government. Churches are having their holiday decorating (nothing like waiting to the last minute) interrupted by Internal Security Force agents. Holiday travelers are being harassed at the airports by new regulations restricting their ability to fly across country. Even Santa himself is getting manhandled by jackbooted thugs during a roundup of folks who oppose the president’s agenda! What has happened to a once great country that used to be all about such awesome freedoms as pickup trucks, pro football and classic rock? Are we such mindless sheep that we would gladly trade some of our more boring freedoms (speech, travel, dissent, etc.) for a little security from some ill-defined threat? 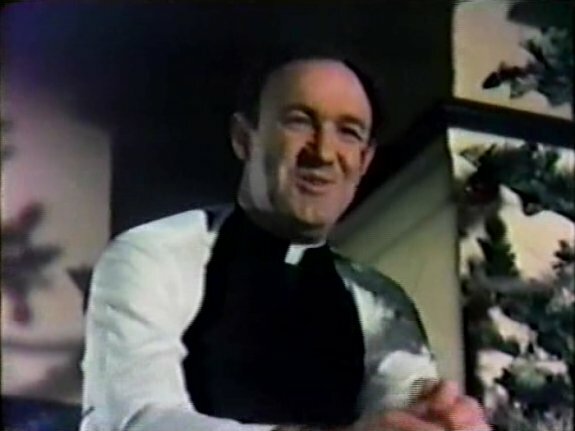 Not one to miss such an obvious opportunity to bludgeon us with its viewpoint, one of the movie’s painful speeches disguised as dialogue has Major Shepherd McCloud haranguing Gene Hackman’s preacher character about life being the struggle for freedom in an attempt to guilt the preacher into pitching in with the anti-government movement. It’s disappointing that the Rev. Thomas Davis can’t muster up much of response other than spewing religious platitudes about God deciding things when the response is obvious to any great American. Last time I checked, Chicken Little, I could still drive my F-150 to the Chicago Bears game while cranking up the Whitesnake and KISS! If that’s fascism, sign me up! 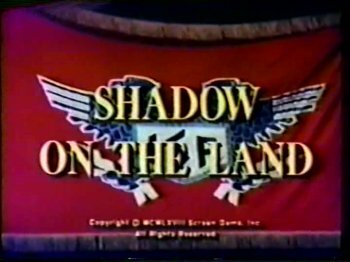 Shadow on the Land of course puts a much more sinister spin on totalitarianism positing that it would involve detention camps and a new government entity called the Internal Security Force charged with maintaining order at all costs. Just so we get the point, the ISF inexplicably has its own logo that calls to mind Nazi Germany with its red background and double eagle symbol. This is all so unrealistic that it’s actually distracting since we know that any detention camps we would maintain for undesirables would never be on U.S. soil so that our enhanced interrogations of terrorists can’t be interrupted by those pesky human rights activists and their liberal courts. And any new secret police would surely use a blue background for their logo, not red! Who wants to be compared to the Nazis? That’s just bad marketing! Circumstances are purposely left vague, but some emergency had caused the President to assume great powers, create this new security force and to clamp down on any opposition. An organized resistance, the Society of Man, has sprung up and operates as the “underground” you would expect to see in such a universe. 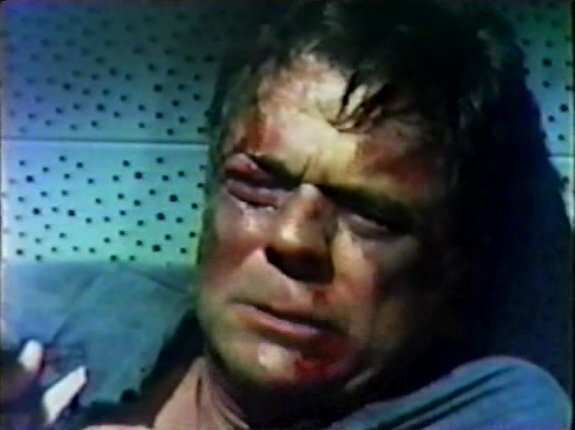 Major Shepherd is a member of the resistance working on the inside to try to restore freedom and has the help of his driver, Corporal Willing while his boss, General Bruce (a scowling John Forsythe) slowly begins to doubt Shepherd’s loyalty once one of Shepherd’s mentors turns traitor. 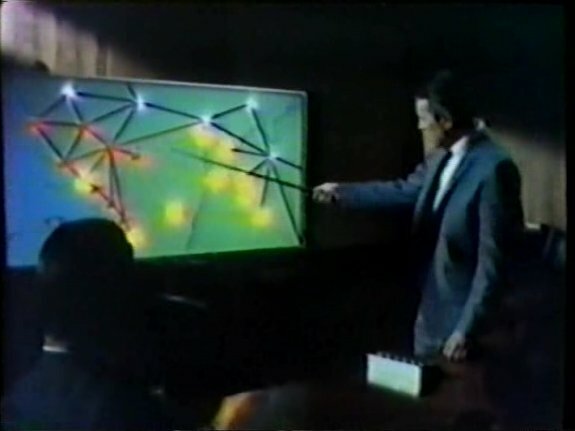 The bulk of the film focuses on the pursuit of Davis and Shepherd’s efforts to assist him, however Davis dies before being able to tell Shepherd about Operation Hammer. Shepherd though learns all about it shortly thereafter directly from Bruce who puts Shepherd on the team that is going to be executing the plan. It’s a curious plot choice since it renders much of the Davis story line meaningless though I suppose it was his death that causes his brother to finally join the resistance. For its part, Operation Hammer involves the government staging an attack on the power grid as an excuse to double the size of the ISF, turn the public against the rebels and institute even more restrictions on everyone’s rights. That’s right America! You’re getting a big fat false flag in your stocking for Christmas! The movie feels accidentally prescient (it’s not smart enough or well thought out enough to give it more credit than that) with scenes where you can’t help but see the parallels to today’s society (Department of Homeland Security and Transportation Security Administration come immediately to mind), regardless of your political leanings. And how odd is it that what must have seemed like a fantasy back when the film aired in the late 1960s (detention camps, airport cops, false flags from our own government) is openly discussed now and feels entirely plausible (depending on whether your candidate is currently in the White House or not). Still, it’s kind of impressive that something like this made it on TV before conspiracy entertainment really took off in the post Watergate era. Ultimately though, watching Shadow on the Land is a strange experience. It isn’t really that good with its characters pontificating to each other about their positions in what feels more like being lectured to than anything else, the ham-handed way the fascist regime is portrayed and the decidedly low tech (and low budget – this was a TV movie after all) way the regime maintains its iron grip on things. The entire set up also feels like it’s cheating with its “America is now a fascist state for some reason we’re too lazy to explain” starting point while its ending resolves nothing giving the film a weird “slice of life in a dictatorship” vibe rather than feeling like a complete story.